Most authorities currently recognise five sub-species of Bean Goose, with eight separate flyways currently identified (Wetlands International 2015). These sub-species’ fall into two groups: Tundra Bean Goose breeds in Arctic tundra regions and Taiga Bean Goose breeds in forested taiga areas to the south. There is overlap between these sub-species, however, and some aspects of Bean Goose taxonomy still requires clarification. Two sub-species Anser fabalis rossicus (Tundra Bean) and A. f. fabalis (Taiga Bean) are found in the Western Palearctic and both occur in Britain, although the majority of birds seen there are of the latter race. 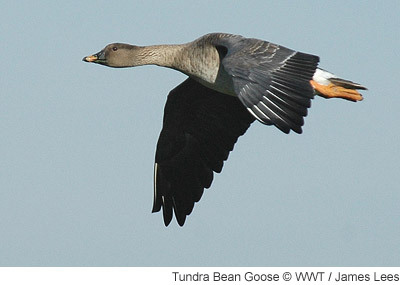 Taiga Bean Goose is an increasing conservation priority as the flyway population has decreased by around a half. WWT is conducting crucial research at the main UK wintering site, and an AEWA Management Plan to focus and prioritise conservation efforts is being developed.